CodeBlock component still depends on old DOM manipulation code and dangerouslySetInnerHTML. Any suggestions to make it better? Used HTML button elements instead of clickable (tab clickable) divs with similar styling. Any downside of that? I'm not much sure about the purpose of consumeEvent.js. Can you think of a better alternative to get the same behavior with React? Wow, thanks for tackling this! I'm a bit busy now but will review next time I get the chance. Hey, sorry for long time no review. I'm putting out some fires related to Node 8 and Windows but hoping to get back to this soon. In the meantime, do you want to try converting the compile-time overlay to this set of components as well? That was the original plan—right now there's too much duplication between them. No problem. Yes. I was thinking to change the compile-time overlay as well. But later I thought to wait until I get feedback for this. Anyway, if this looks good I'll try that and update the PR. @gaearon Updated PR with changes to compile-time overlay. I had to refactor several files and that's why more files have changed. Let me know if you need it to be a separate PR or anything to make it easier to review. I'm not sure why AppVeyor build has failed. Maybe we need to trigger the build manually again. This is because we use a version of jsx-a11y plugin that happened to publish its internal Flow sources on npm. If you explicitly add it to [ignore] section in .flowconfig this should be fixed. @gaearon Thanks for the tip. I'll update and see. * Refactor react-error-overlay components to container and presentational components. * Make the compile-time error overlay a part of react-error-overlay package. * Use react-error-overlay as dependency in react-dev-utils to show compile-time errors. 🎉 @gaearon ready for the review. 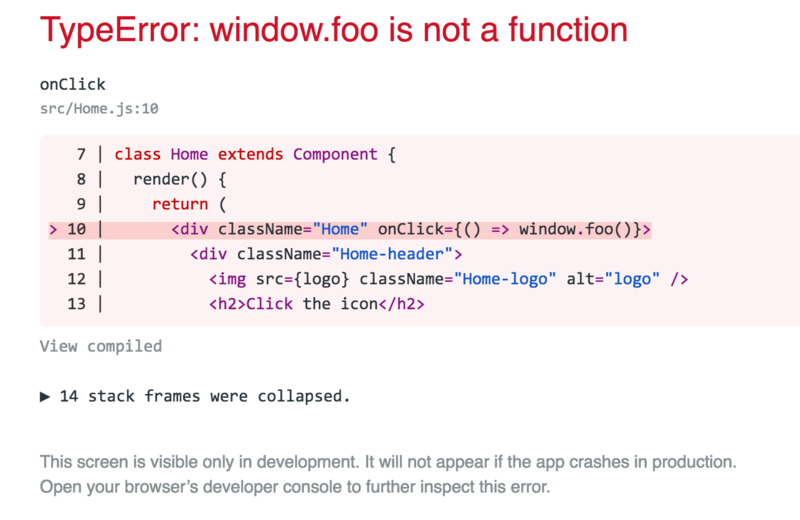 @tharakawj Would it be possible to easily integrate react-error-overlay in a non-CRA project? It is already possible. Although API will change. I finally got the time to look into this. I think this is mostly good except for some minor things. I wanted to check—would you be willing to finish this up in response to review, or would you have somebody take over this? I understand it's been a long time and you might be busy or uninterested. In any case thanks for much for this! @gaearon Yes! I'm here. Let's finish this up. I think this part got lost. 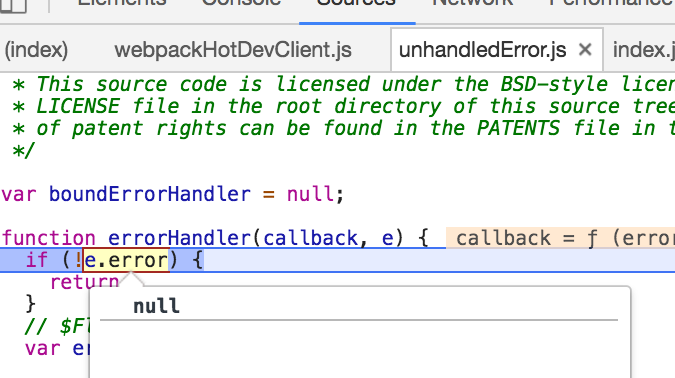 I can't click on the source code snippet but I used to be able to. Shouldn't we check iframeReference instead? What if we call showCompileErrorOverlay() twice in a row before mountOverlayIframe callback returns? Wouldn't that result in two iframes being created? I'll write up some next work directions if you're interested. Aside from the path to the bundle being at static/js/bundle.js, what other assumptions does error overlay make about a React app? Want to use it outside of CRA. @gaearon Nice! Yes please, I'm happy to contribute more. Yeah would love to get this into Gatsby! Happy to take a PR if there's something that doesn't let it work out of the box for you. Can you give me an example to look at? The event.error property is null so we can't extract that data. This happens when the code that throws is from a different origin than the app.